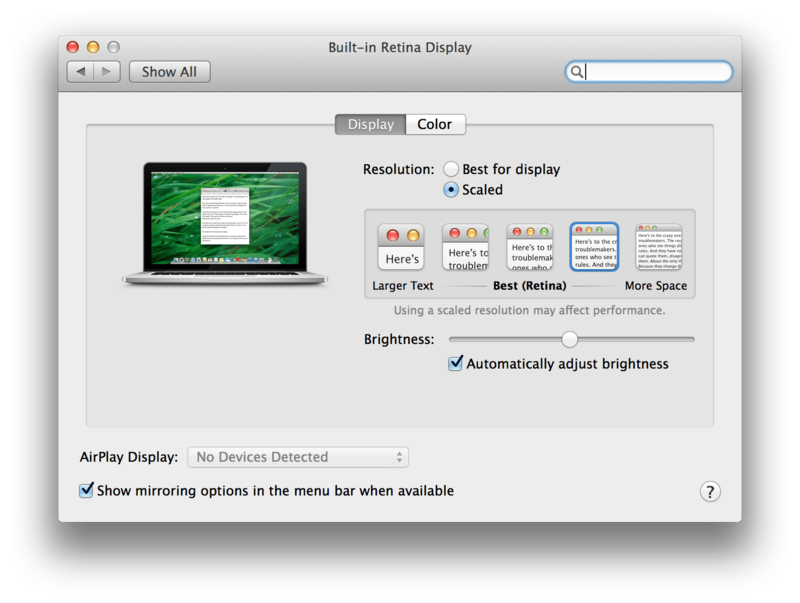 Do you have a Retina MacBook Pro? Posted by Julien Melissas on June 27th, 2014 . This is by-far the best computer I’ve ever owned. I came from a 13″ MacBook Pro with the optical drive replaced with an SSD, and 8GB of RAM. That computer was great. Fast, strong, sturdy, just about everything was awesome. Anyways, when you power it on for the first time you’re like wow, but it ships with one flaw. So many friends that have gotten these don’t ever think about the fact that this screen is packed with so many pixles – but everything is so huge. Why is that? Really. It’s a crime that Apple ships these things with that stupid-huge screen resolution. You can’t fit anything on the screen! Your mind will be blown when you change the resolution. How were you using the computer this whole time like that? It’s easy. Go to System Preferences > Displays > Scaled, then pick the one selected below or the one that says “More Space” if you’re really looking for a change. I switch between the two depending on what I’m doing.